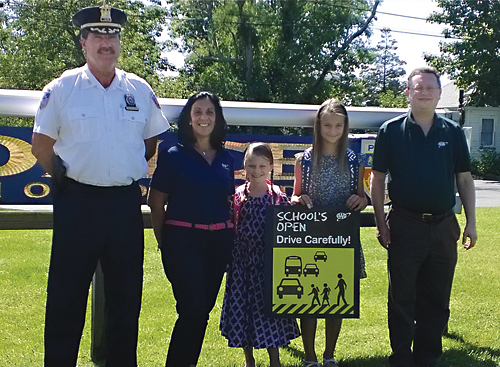 The American Automobile Association’s 2014 ‘Schools Open, Drive Carefully’ campaign kicked off locally last week at Southold police headquarters in Peconic. Police Chief Martin Flatley joined local school children and AAA New York representatives to remind drivers to use extra caution on the roadways. “School’s Open” posters plan to be mounted around Southold Town. The annual campaign, which began in 1945, features thousands of posters, bumper stickers and other educational materials.